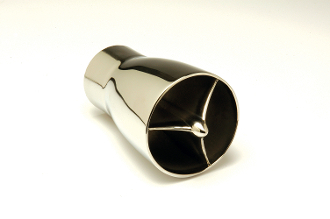 Our Astro stainless exhaust tips are out of this world. They look like they may be spare parts from Buck Rogers’ ship, or perhaps a 1950’s Detroit dream car. Precision formed from .090" thick stainless steel and hand polished to a mirror finish, these distinctive exhaust flares are sure to help your bike stand out in the crowd. These fit into a 2" OD tailpipe, and are held in place with a stainless screw (included). These are extremely high quality parts crafted in heavy gauge stainless steel, they will last forever. This item measures approximately 2.75" wide X 4.0" deep X 2.75" high.